Air coolers are quite popular in India. It is partly because the air coolers are affordable and have low operational cost. Unlike expensive Air Conditioners, the air coolers are eco-friendly as they do not use or emit any harmful gases at all. Orient Electric, a respected Indian consumer electricals brand, has a complete range of air coolers to suit varied evolving needs, aesthetic preferences and usage environments. One of the highlights from its personal cooler line-up is Supercool CP5202H which the company claims to be the perfect blend of form and functionality. Let’s take an in-depth look at this air cooler. 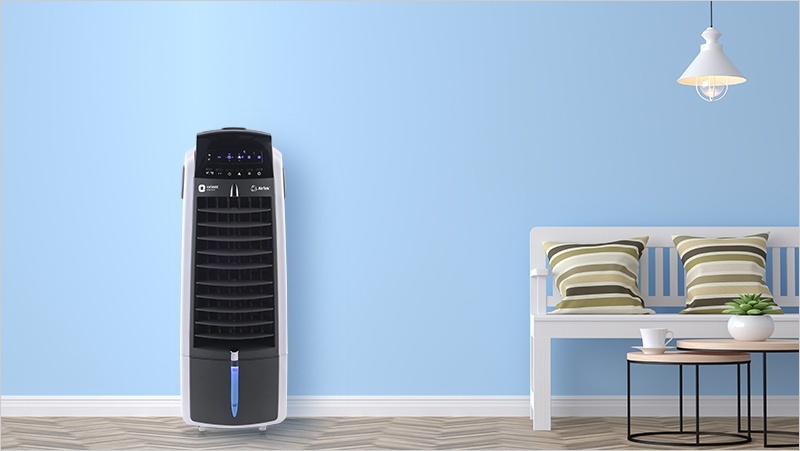 Being a personal air cooler, the Supercool CP5202H has an elegant, vertical design. It is designed to fit within small spaces and can be easily moved around the house, thanks to its wheel base. The top half of the cooler has fan vents. While the bottom holds a water tank. Don’t be tricked by the slim body as Supercool CP5202H accommodates a huge water tank that can hold up to 52 litres of water. There’s an elaborate control panel on the front, with indicators for fan speed and air flow modes. It is way better than the confusing knobs and buttons seen on the conventional air coolers. Below that is a fan window, guarded by the collapsible blinds. It effectively blocks the dust from entering the machine. The air cooler is made of high grade plastic that ensures durability. 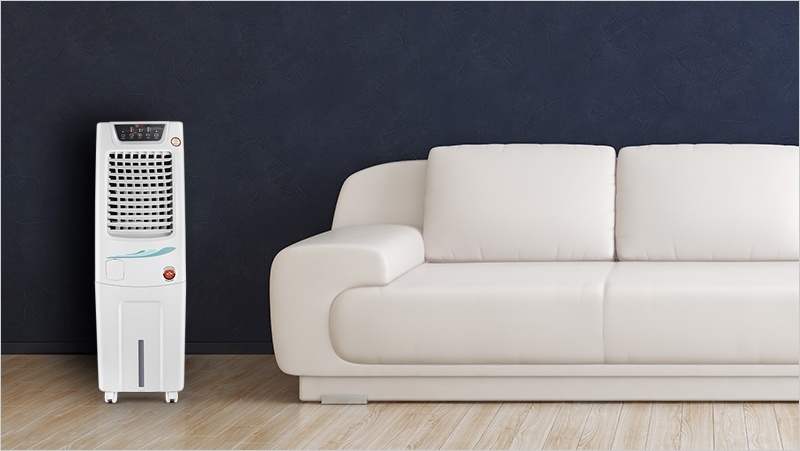 The air cooler looks elegant in white with only a small mint colour design on the front. 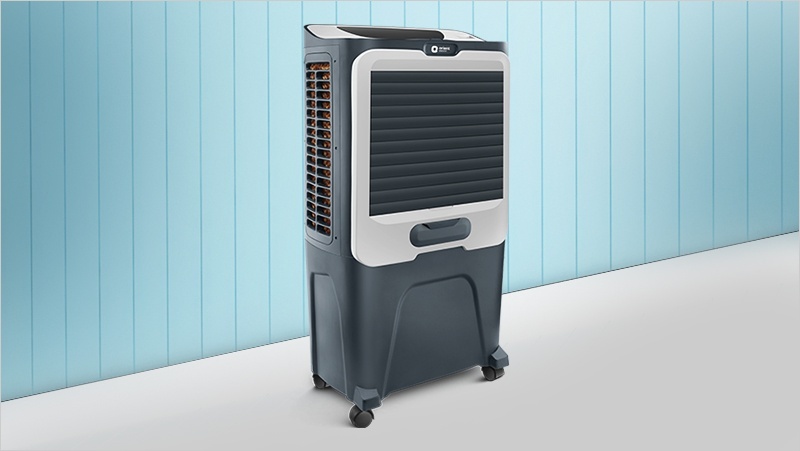 The Orient Supercool boasts of an astounding air delivery of 1300 cubic metre per hour. It has the air throw distance of 25 feet, which is ideal for a standard urban room size in India. The air cooler features vertical as well as horizontal motorised louvre movement. 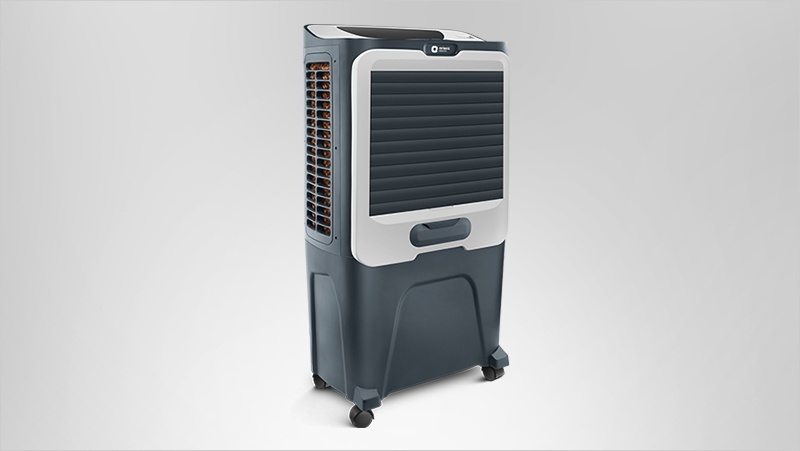 With 4-way air flow system, the Supercool can provide uniform cooling in your room. 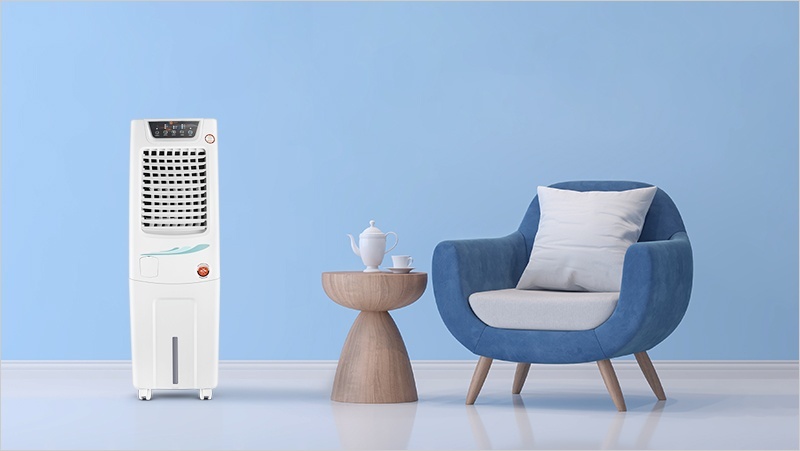 This compact air cooler uses honeycomb cooling pads with Dense Nest features that offers 45 percent more water retention which further leads to faster and efficient cooling. The honeycomb cooling pads also have other advantages. Compared to the aspen cooling pads seen in the old air coolers, the honeycomb cooling pads are more durable and efficient. The Orient Supercool has a neat control panel. But, you are more likely to operate it using the convenient remote control. You can control the fan speed and direction of air flow from the comforts of your chair. The air cooler has an auto-fill feature that pulls water from a connected inlet as per the requirement. This saves you from the trouble of checking on the water level and filling the tank manually. Regular air coolers have open type water tanks which double as breeding grounds for mosquitoes. 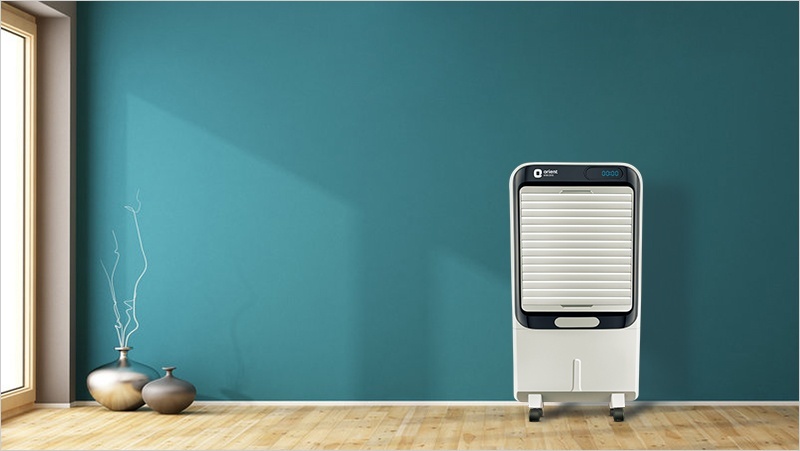 The Orient Supercool addresses this concern as it uses a solution, which when mixed with water prevents the mosquito breeding. 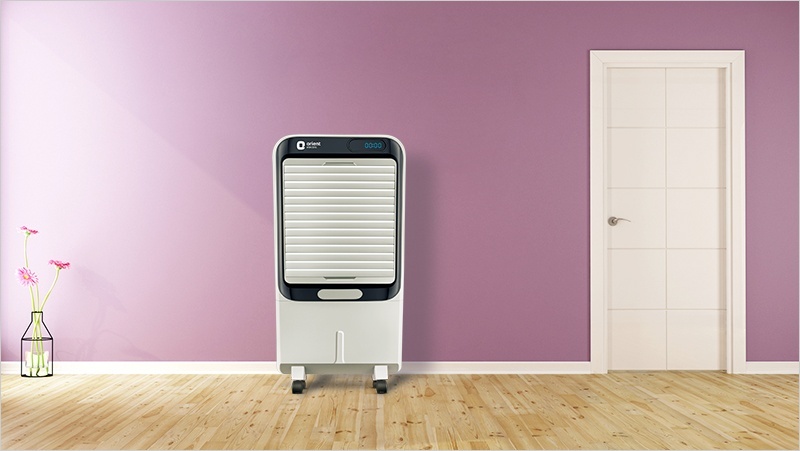 In addition, Orient Supercool is fitted with a carbon dust filter, which uses activated carbon to remove impurities from the air. To maximise the cooling comfort on a sizzling summer afternoon, you can add some ice into the cooler’s ice chamber. Also, you do not have to worry of the unexpected power cuts, as this cooler also runs on inverter power. The Orient Supercool CP5202H is a compact personal cooler ideal for small spaces. For better cooling and efficiency, Orient has used Densenest honeycomb cooling pads. Its specially designed fan with unique angle enables maximum air throw and superior cooling. For Rs. 12,999, the Orient Supercool CP5202H is a perfect fit for your modern house for the summers. The company offers a 1-year warranty on the product. For queries and assistant, you can reach Orient on 18001037574.